Asprey - All The Watch Straps You Need And More! 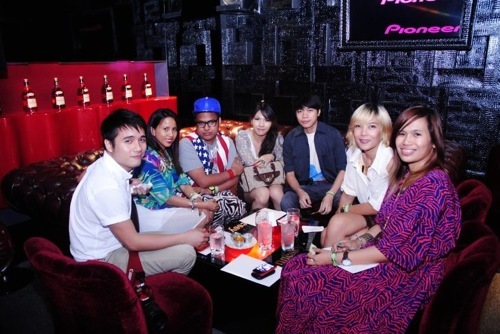 Manila's fashion bloggers flocked to Scarlett Wine Lounge in the Fort to witness the launch of Asprey's newest brand ambassadors which included none other than fellow bloggers Lissa Kahayon and David Guison. Aside from Lissa and David, College Jock and Model Victor Pring, Myx Vjs Joyce and Mike Advincula and Kato Chua of Moonshine Garb were also announced as ambassadors. Prior to the event, all attendees were requested to bring their old watches so Asprey could breathe new life into them by adding our choice of new straps. With Asprey's wide selection, this decision was not exactly that easy to make. Asprey carries straps in all shapes, sizes and colors for practically any watch. From sporty leather straps, formal pieces, "oris"-like straps, to my favorite, fun NATO straps, Asprey definitely has a strap that will cater to everyone's specific taste. 1. I got instaxed by Paul, pretty cool right? Getting chosen as "Best Dressed On the Asprey Bloggers Night" won us some cool watches from Converse and L Time Studio plus additional NATO straps! Having fun with my straps! Asprey is available in most leading department stores nationwide. Watch strap price range is around P200-P1000 for men's straps. Very affordable indeed.